I bought the 3rd video 'the silencer' and that was amazing. However, english is not my 1st language so if someone can explain to me in Pm or in spoiler mode what's the story, It will help me. Thanks. I just bought silencer recently, it's real good to see girl power makers back in the fold again it's just to many peril heroines video out there and not enough girl power superwomen videos much anymore so its real good to start seeing ithem again, your silencer episode was superb from the acting to the special effects and editing was on point too, your actress who plays charlie is probably the best neck breaker out off all the girl power superwomen genre that I've seen and I've seen plenty too, those neck breaks that she performed were brutal and look like they. Hurt tremendously with the sound effects on so keep them coming, I hope we see more of the lex character too she very interesting just by the small appearance she had on screen but anyways keep up the good work your doing great!! I have many ideas about what to do more now and what to do in the future with more money to use but the only thing is important at the end of this post is to again thanks Jess & Co because a dream is in progress and my fear is that the momentum will decrease in the future so WE must all help them to keep high the motivation. Hey Jess I would like to see you do a superpowers 101 type of videos with both charlie and sasha, like a assassin 101 with Charlie showing how to dispatch enemies properly & professional and a 101 with sasha revolving about her telekinesis power that would be great to do. Personally, I wouldn't mind seeing feats of strength and power with bare legs and feet. Maybe like one of the "heroes" tries to catch one of the girls off guard at her home when she's comfortable. I want more video with Charlie! Flying and a Shazam type transformation be it good or bad. Shazam type transformation? Could you elaborate on that? A new Charlie video is in the works as we speak! Jess, I think that one of the things you might work on is super-speed, I know it's not easy to make on screen, but I the current efforts on it are a little below waht you did with other superpowers, at least in my eyes. Like saying a word and transforming into costume or aging powers . After a long absence, I know I'm late to this discussion, but since it gives us the opportunity to say what we want to see in Wiked City Girls, I suggest for my part more female Super strength. This will seem very simplem aybe classic for what I've read (and understand) in this discussion. 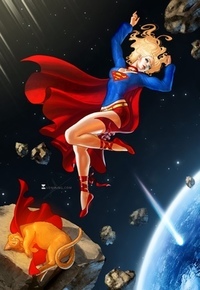 But for me and many of us, Super strength and Invulnerability remain the main power of a Supergirl. And when I mean Super strength, I would like to see car lifting or kind of stuff. I think special video effects are becoming better of what I saw. Thank you very much for considering my request. a new charlie vid in work! great! Hope I don't get skewered for this, but what about a girl with a bit of muscle on her. (As much muscle as you want for my preference) My fave from the project: superwoman was when Aubrey was in the lead role. There's something to having the character actually look like they can bend steel. I know this sort of actress might be hard to come by but a character with a visible bicep doing a throatlift would be something to see. I wouldn't mind an actress with some muscle on her as well. (directed by the guy who took the power girl photos). But she's in fantastic shape, and really does look the part. Still wouldn't mind seeing a bit of leg. Some feet would be nice too But that's just my taste. When will nex video be released ? Our next release will be a brand-spanking-new Silencer!